Ultimatte-Software.com - Sales of Ultimatte AdvantEdge plugin for Avid, Premiere, Final Cut Pro, etc. The solution: Ultimatte AdvantEdge plug-in for your favorite editing or compositing application. The Expanded AdvantEdge Advanced Control Interface. Do you work in many different NLE or compositing packages? Have you struggled to ﬁgure out the idiosyncrasies between all of the different packages? What about the plug-ins? They’re different in each package. With the Ultimatte AdvantEdge plug-in, it does not matter which host application you are using. AdvantEdge will look and feel exactly the same in each of the 20 supported host applications regardless of whether you are running Mac, Windows, Linux, or Irix operating systems. Because each plug-in is identical, you’ll have the ability to save and load ﬁle settings between any host application as well as any operating system. How do you know which control to set and how much to adjust it to accomplish a particular feat? There are over 100 different controls and some are interactive with others! Don’t worry. AdvantEdge offers sophisticated automation. Simply sample problematic areas in the image, and AdvantEdge will automatically choose the proper controls and set them to their “best value”. Allows AdvantEdge to automatically set the best value for Roto Screen Correction, Matte, Spill, and Color controls by sampling problematic areas in the image. Reduces the effects of “cyan undercutting” seen as a smeared red edge in areas of sharp transitions in ﬁlm shots. Reduces the effects of matte lines introduced over-densing the matte, which could be caused by excessive spill onto subject matter. Import a clean plate to eliminate the problems of a “bad” bluescreen. Allow AdvantEdge to generate a synthetic clean plate for you to eliminate the problems of a “bad” blue or green screen. Reduces the blocky artifacts created through 4:2:2, 4:1:1, or 4:2:0 video chroma compression which always compromises the quality of the extracted matte. 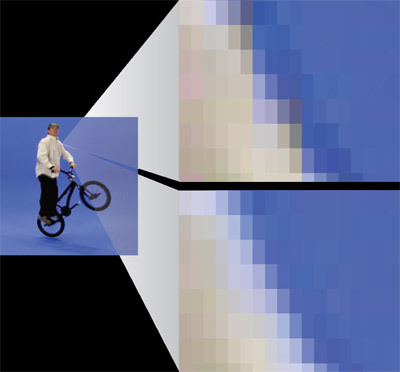 Blocky transition from 4:1:1 or 4:2:0 video sampling / DV or XDCAM compression. Smooth transition after using the AdvantEdge video correction option. Sub-pixel matt sizing and softening allowing for a "Smart Choke & Blur" on the matte. In conjunction with Roto-Screen Correction, allows for independent control of shadows including density, softness, and tint. Allows for individual RGB control over the foreground Brights, Midtones, and Darks, as well as Hue, Saturation, and Brightness. Improved Clean-Up controls to compensate for anomalies in the screen area including Shrink and Blur.